AM Rentals, Cornmarket, Newry BT35 8BG heater sales. 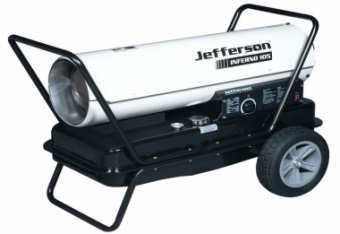 Jefferson space heaters for sale in Northern Ireland at great prices from AM Rentals. Diesel, paraffin or kerosene powered space heaters, also known as direct oil heaters are the ideal tool for heating large spaces such as warehouses, garages, showrooms and workshops. These space heaters have an adjustable thermostat to control heat output, stainless steel combustion chamber and an integral fuel gauge. The 105,000 btu and 150,000btu models come with rubber wheels to make moving around easy. The IR range of space heaters are ideal for heating noise sensitive areas as they burn a lot quieter than the standard inferno models. We can deliver your brand new space heater to anywhere in Ireland, call us today to order yours! As with all fuel burning equipment adequate ventilation is essential. Introductory space heater in the Jefferson range. The Inferno 60 space heater has 60,000 btu or 18kw power output. This heater features a 19 litre long running fuel tank, a running time of approximately 11 hours and weighs just 12.2kg when empty. This is an ideal heater for warming smaller areas or workspaces. As alway ensure adequate ventilation when in use. Mid range space heater in the Jefferson range. The Inferno 105 space heater has 105,000 btu or 31kw power output. This heater features a 38 litre fuel tank, a running time of approximately 13 hours and a maximum fuel consumption of 3.0 l/h. The Jefferson Inferno 105 is fitted with rubber travel wheels that allow for simple manoeuvring around. This heater is ideal for large areas that need to be heated. Largest space heater in the Jefferson range. The Inferno 150 space heater has 150,000 btu or 44kw power output. This heater features a 49 litre fuel tank, a running time of approximately 12 hours and a maximum fuel consumption of 4.2 l/h. This is the ideal heater for large spaces such as warehouses. The Jefferson Inferno 150 comes fitted with rubber wheels to make it easy to move around the site. 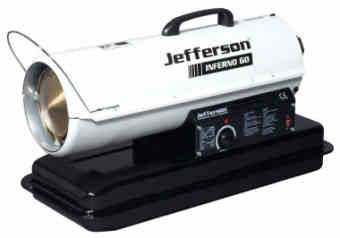 Jefferson Inferno IR70 infra red heater. 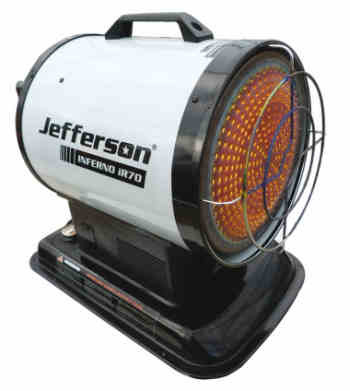 Jefferson Infra Red IR70 space heater is suitable for indoor, well ventilated environments. It features a clean and efficient burner that will run off diesel, paraffin and kerosene. The IR70 is fitted with an automatic shut off to ensure safe operation. This space heater is ideal for use in noise sensative areas as it runs alot quieter than the direct heat space heaters. Very quiet and fuel efficient. We can arrange delivery of your new Jefferson space heater to any county in Ireland, call us today for a quote. ROI VAT registered customers do not have to pay VAT in NI. Send us in a purchase order on company paper and we can zero rate the VAT. Our complete range of space heaters can run off diesel, kerosene or parrafin fuel. It is important to only use a space heater in a well ventilated area, exhaust fumes can kill. Telephone us at Newry 028 302 66665 (from ROI) 0044 28 302 66665.